Prayagraj (Uttar Pradesh): Governor of Uttar Pradesh, Ram Naik on Saturday approved the renaming of Allahabad as Prayagraj with immediate effect. UP Governor Ram Naik today approved the renaming of Allahabad as Prayagraj. 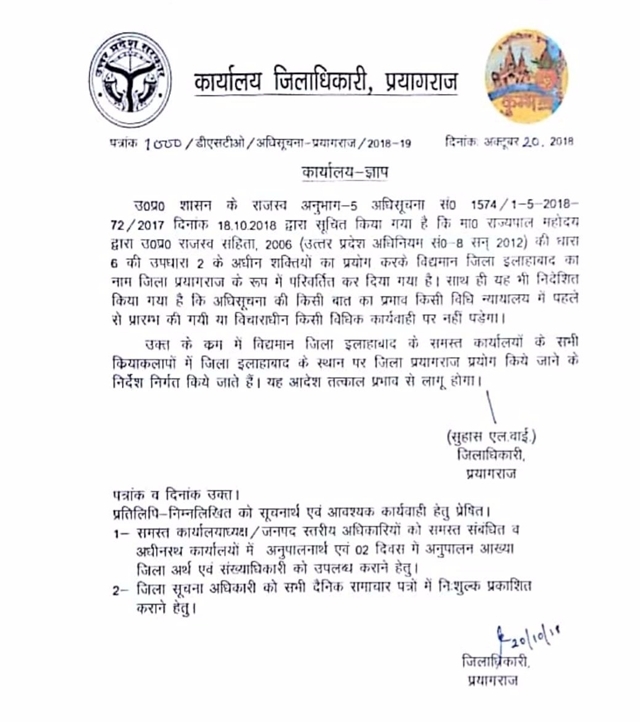 The government notification issued by the District Magistrate of Prayagraj, Suhas L Y read that the Naik has approved the change of name of the existing Allahabad district to Prayagraj district. “The name of the district has been approved by the governor under section 6, subdivision 2 of the Uttar Pradesh Revenue Code, 2006 (U.P. Act No.8 of 2012),” the notification read. The notification would not have any effect on the ongoing cases or legal proceedings in the court of law. It has also been directed that all the official activities would now be carried out under the new name, Prayagraj. On October 16, The Uttar Pradesh government led by Chief Minister Yogi Adityanath formally rechristened the name of Allahabad to Prayagraj.